Tracy Wilson of The Woodsrunner School in South Carolina holds a starter bundle she lit using a bow drill Thursday afternoon at Rocky Fork State Park. Looking on is Dave Canterbury, organizer of the Pathfinder Gathering being held at the park campgrounds this weekend. 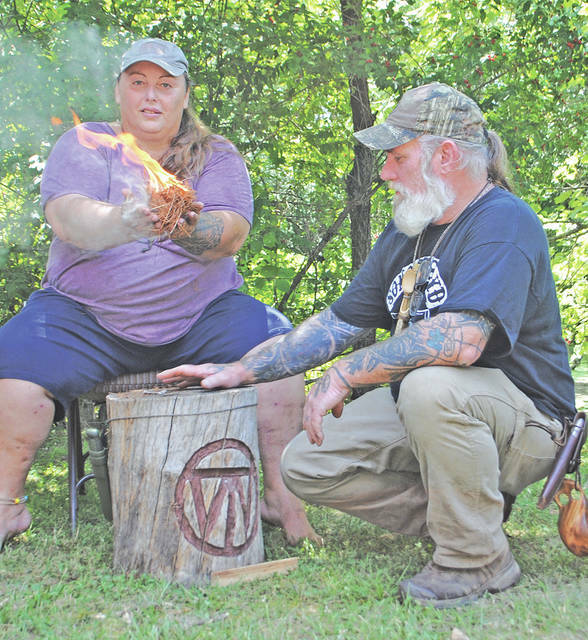 About 300 people from around the country and elsewhere are converging on Rocky Fork State Park this weekend for the 2018 Pathfinders Gathering organized by Dave Canterbury, a former star on the Discovery Channel’s “Dual Survivor” series. In past years the Gathering has been closed to the public. But this year, while it’s too late for the public to participate in the classes, seminars and workshops, visitors can watch and learn. Canterbury said the Gathering is a family-oriented event that is more about bushcraft, or learning skills to survive off what nature has to offer, than anything else. In addition to his two seasons on “Dual Survivor,” Canterbury co-starred in a 2015 survival series called “Dirty Rotten Survival” on the National Geographic Channel; was on “Pathfinder Outdoor Journal” on Hunt Channel TV; said he has authored two New York Times best selling books including “Bushcraft 101;” and owns the Pathfinder School in Jackson, Ohio where he teaches survival techniques, promoting what he calls the “5 Cs of Survivability:” a cutting tool, combustion device, cover, container and cordage. But he said most people know him due to his 560,000 YouTube subscribers with 80 million video views. He runs the National Pathfinders Youth Organization, with chapters in different states, that provide gear and training for “underprivileged kids” that otherwise would not be able to experience the outdoors, and owns Self Reliance Outfitters. This is the seventh or eighth for the Pathfinder Gathering at Rocky Fork, Canterbury said, and campers this year include four from Denmark, one from England and others across the United States from California to Florida. They include about 20 vendors of outdoor-related items and 50 to 100 kids attending with their families. The Gathering, held in the Dovetail area at the Rocky Fork Campground, is open to the public from 8 a.m. to 8 p.m. Friday through Sunday. Workshops are offered from 9 a.m. to 3 or 4 p.m. Friday and Saturday, and Canterbury said that in the evenings survival-related challenges are held between the campers. Canterbury said his appearance on “Dual Survivor” was due to YouTube. “They saw the videos, called, and asked if I wanted to be on the show,” he said. His said his current career path started by participating in 18th century re-enacting, flint knapping and making bows. Basic Blacksmithing – 9 a.m., 11 a.m., 1 p.m., 3 p.m.
Flint Knapping – 9 a.m., 2 p.m. Primitive Navigation – 10 a.m. Bow Drill Clinic – 11 a.m., 4 p.m. Knife Build Group 1 – 11 a.m. Knife Build Group 2 – 3 p.m.
Willow Basketry – 3 p.m. Ax Hanging & Sharpening – 9 a.m. Wool Hood Making – 9 a.m. Knife Build Group 1 – 9 a.m.
Leather Belt Pouch – 10 a.m.
Spoon Carving – 10 a.m., 2 p.m.
Flint Knapping – 1 p.m. Knife Build Group 2 – 2 p.m. Medicinal Prep – 1 p.m.
Oak Basketry – 3 p.m.
Reach Jeff Gilliland at 937-402-2522 or jgilliland@timesgazette.com. https://www.timesgazette.com/wp-content/uploads/sites/33/2018/07/web1_Fire-starter-pic.jog_.jpgTracy Wilson of The Woodsrunner School in South Carolina holds a starter bundle she lit using a bow drill Thursday afternoon at Rocky Fork State Park. Looking on is Dave Canterbury, organizer of the Pathfinder Gathering being held at the park campgrounds this weekend.